Send Yummy Fererro Rocher to Chennai. Gifts to Chennai. Send Chocolates to Chennai. 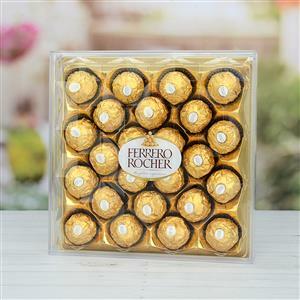 Description : If your loved ones in Chennai are fond of Ferrero Rocher chocolates then you can send this box through Gift2Chennai.com. Your loved ones will definitely be enthralled to receive these chocolates with other Gifts to Chennai. 24 Pcs. Fererro Rocher Chocolates, just the right gift for someone you care. Note that the picture is indicative. The container might vary.